Food is what fuels our city. But what actually fuels our lives? One word – short, precise, right and simple… it’s love. Especially for this month, the joy of love is filling the air and it seems to be fiercely competing with the polluted air we’re currently facing. So as Valentine’s Day is drawing near, all you love birds out there are probably cruising the street, looking for a place to celebrate a love-laden dinner with your significant other. Well, search no more. We’ve curated a list of where to take your lover to wine and dine this Valentine’s Day. 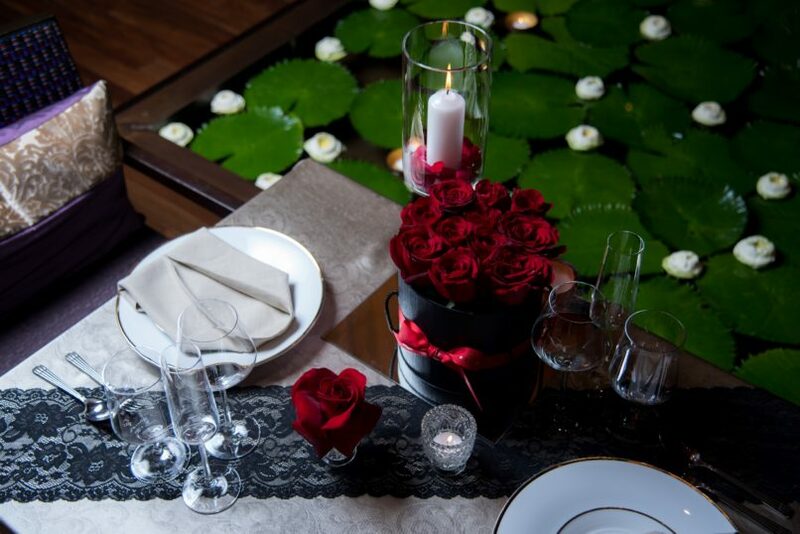 From contemporary French cuisine to seafood fare, Italian dishes and BBQ Buffet, Mandarin Oriental, Bangkok has got a selection of love-themed candlelit dinners to cater to every couple’s palate. Settle for Le Normandie (THB 25,000++ per couple) if you love modern French delights. Or opt for Lord Jim’s if your woman (or man) loves seafood-enriched meals (THB 10,000++ per couple). Got a thing for Italian cuisine? Ciao Terrazza is also here to serve you their special Valentine’s Day menu (THB 9,000++ per couple). But if you and your lover are more of an all-you-can-eat person, a BBQ dinner (THB 9,000++ per couple) at the Riverside Terrace is just the perfect match. Led by the mastermind Chef Henrik Yde-Anderson, the Michelin-starred Sra Bua by Kiin Kiin has been delighting Bangkok’s dining scene every season with their spectacular modern Thai-inspired dishes created and presented with an experimental yet courteous touch. And this Valentine’s Day is no exception. 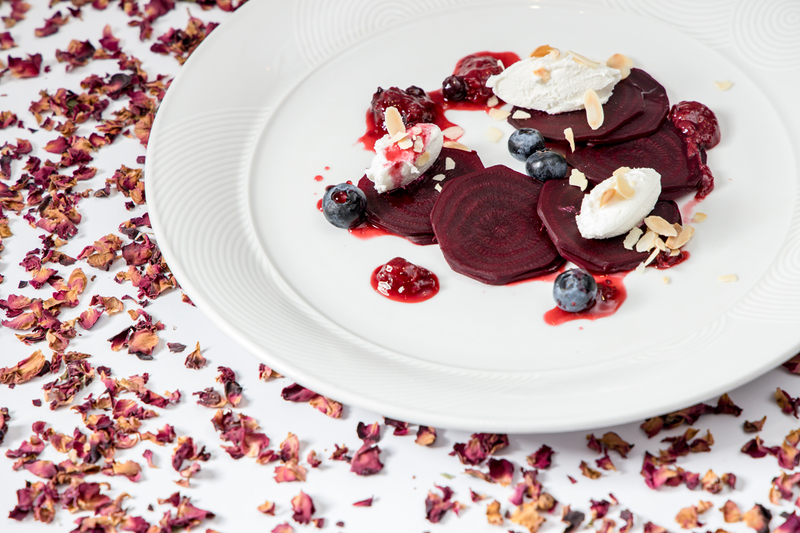 The venue is ushering in the day of love with the “Rhythm of Love,” an eight-course menu made especially for couples. Menu highlights include Frozen Cod Fish Salad with Cod Roe and Cod Crackling (for her); Warm Cod Fish Green Curry and Beetroot (for him); Scallops with Pea Pure Green Asparagus and Spicy Yuzu Sorbet (for her); Fried Scallops with Buttered Thai Fermented Cabbage (for him). Got a sweet tooth? Desserts are Passionfruit Sorbet with Orange Foam, served in a dome for the lady, and Passion Fruit Soufflé with Orange and Passionfruit Salad for the gentleman. Priced at THB 12, 999++ per couple, the Kiin Kiin-style dinner will also be elegantly paired with a bottle of Duval-Leroy Fleur de Brut Premier Cru Champagne. Open Mon–Sun, 12 pm–3 pm and 6 pm–10:30 pm. A picnic by the river is romantic. 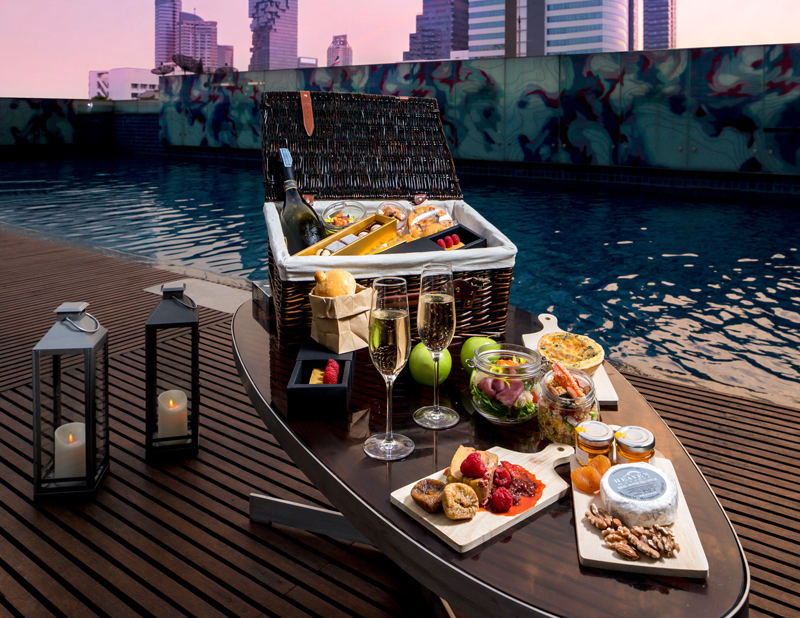 But picnicking by a sky-blue pool with a backdrop of Bangkok views sounds equally dreamy, too. So if you’re liking the idea, head over to Plunge Bar at Le Méridien Bangkok on February 14 to enjoy a Valentine’s picnic by the pool with an accompaniment of live classical music. Packed to the brim with savoury and sweet bites, the poolside dinner is great for lovers who love having a meal in a chic and chill vibe. The picnic basket also comes with a bottle of opulent wine. And the price of the picnic set per couple varies depending on the type of wine you pick; THB 4,500++ for Nua Prosecco, THB 6,000++ for Veuve du Vernay Sparkling Wine and THB 11,000++ for Bollinger Champagne. Open Mon–Sun, 11 pm–6 pm. Tucked away in Soi Methiniwet, Karmakarmet Diner is a little woodland restaurant hidden behind the vastness of The Emporium and Benjasiri Park. With a dose of western cuisine influences, the food here is a perfect model for a straightforward western meal, with not much of a bizarre culinary mix and match. 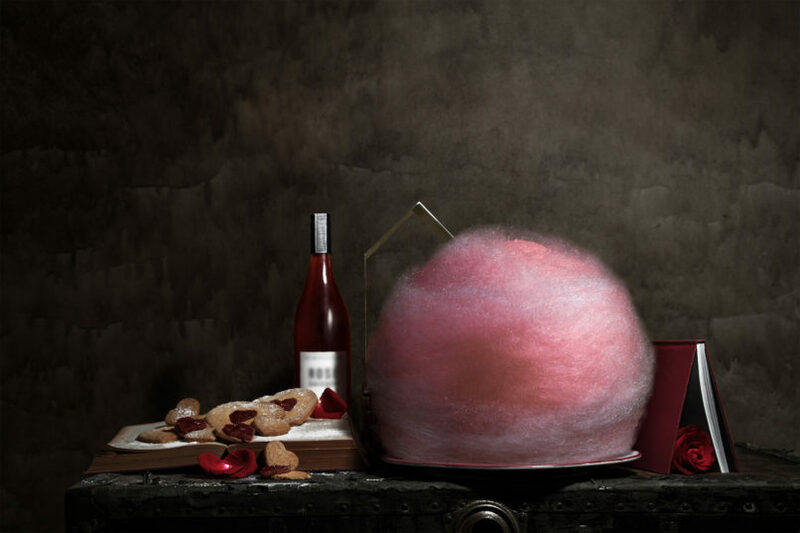 Partaking in Valentine’s Day this month, the venue represents a toothsome five-course dinner laden with pink-basted dishes, for example, the Hot–Red Beet Layers and Cosmo Valentine’s Cotton Candy. Priced at THB 4,500++ per couple, lovers can expect to indulge in a gourmet main that includes your choice of meat like lobster, quail or wagyu beef. Looking for a secluded restaurant for your exclusive dinner? This place will give you just that. Open: Mon–Sun, 10 am–11:30 pm. Set in the Thai-style teakwood pavilion, the riverside restaurant “Salathip” within Shangri-La Hotel boasts the old Siam feel that reminds you of the good times in the olden days. 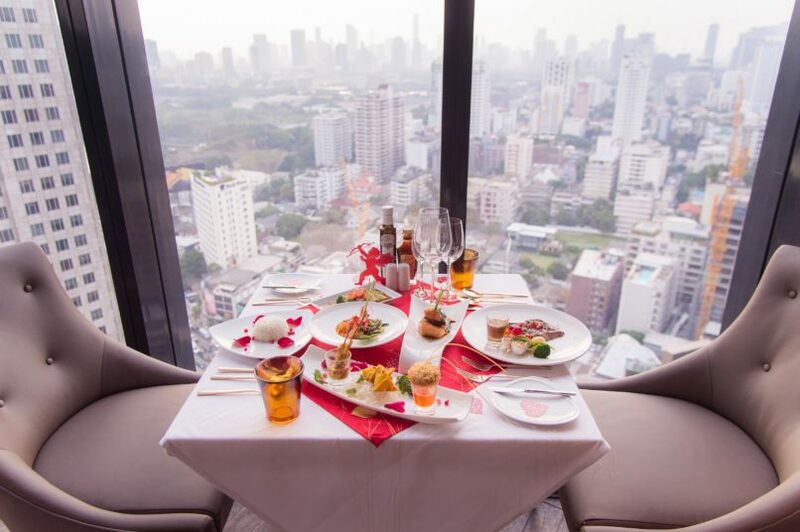 And if you and your lover truly are fans for all things that echo Thainess, it will absolutely be a safe bet to settle for a Thai food set menu here on Valentine’s Day. Featuring Salathip’s best-selling dishes, the Thai set dinner (THB 3,200++ per person) will also include a glass of sparkling wine along with a traditional Thai dance performance. 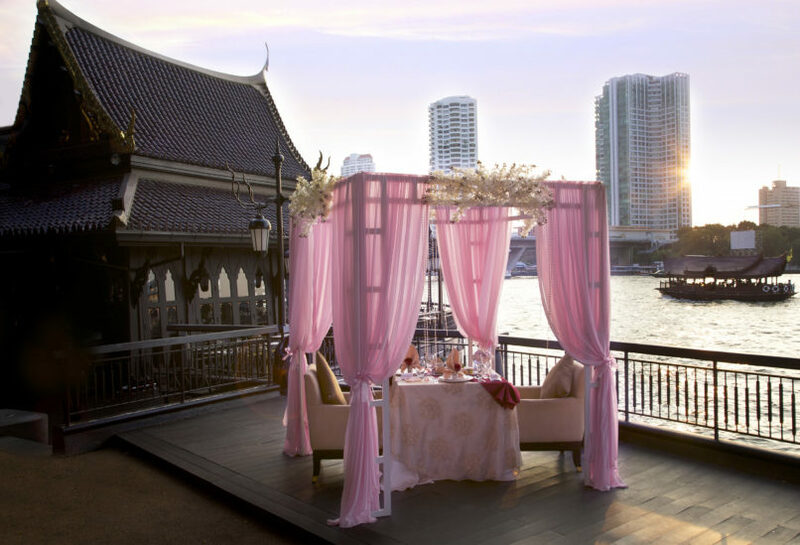 Diners with a minimum bill of THB 10,000++ per table can also request to be seated at the pink gazebo by the river to complete the ultimate Valentine dining experience. 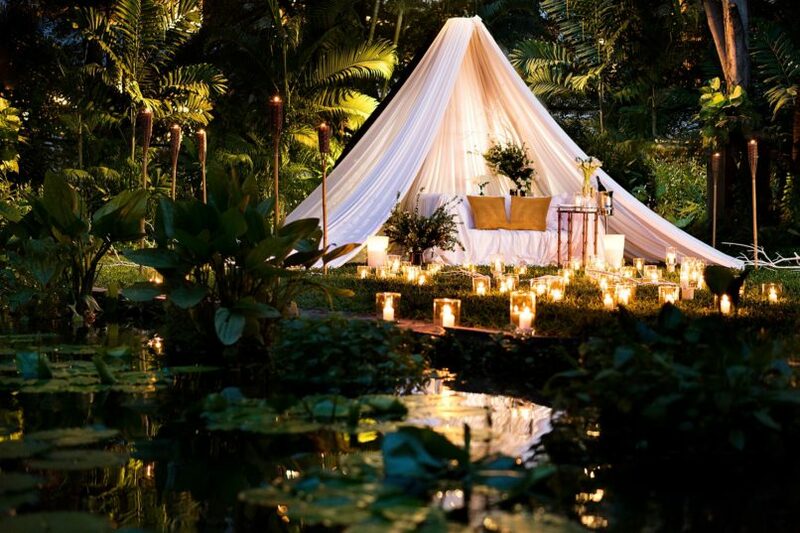 A tent, wine and palm trees surrounded by hundreds of candles: this Valentine’s Dining by Design curated by Anantara Siam Bangkok Hotel is basically a dream happening without sleeping. Set by the poolside of the luxury hotel, this dramatic gastronomic dinner will delight your senses with the delectable dining experience set in a candle-lit romantic setting. For more details and reservations, contact dining.asia@anantara.com or call +662 126 8866 ext. 1201 to get your alfresco dinner organized just the way you like it. We all know, Italian food is one of the most romantic meals you could imagine having on Valentine’s Day – or on a date. So on February 14, treat your tastebuds with a five-course tasting menu packed with modernized Roman staples at Medinii, an Italian restaurant within The Continent Hotel Bangkok. Priced at THB 4,599++ per couple, the scrumptious meal will be served on the “Amore” themed table by the window overlooking the lively streets of Asoke as well as being accompanied by romantic love ballads live. 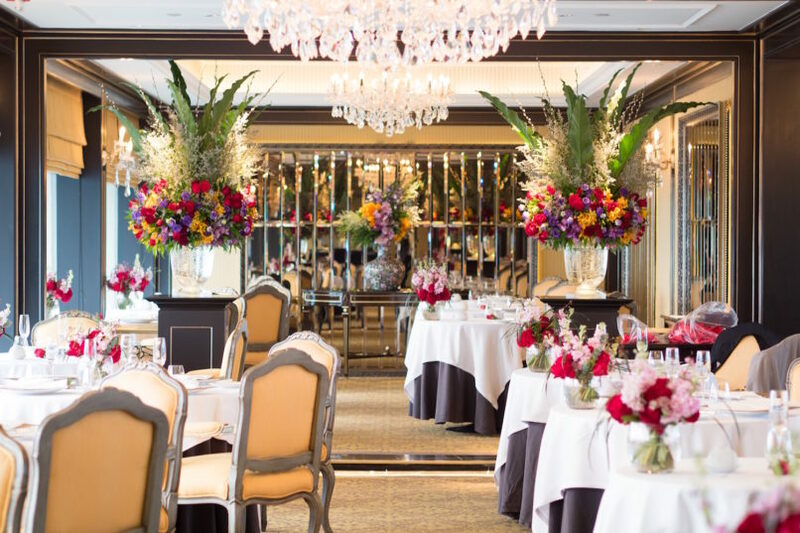 Festive and fabulous, Valentine’s Day dinner here will make your heart sing an opera after the first bite. Open Mon-Sat, 11:30 am–2:30 pm for lunch and 6 pm–12 am for dinner; Sunday 12 pm–4 pm.